. . . . . . . . . . The Daruma Museum and Gallery Pages . . .
and its depictions in the various Arts and Crafts. Use your browser to find a keyword.
. Contents A - C . - - - . Contents D - F .
. Contents G - J . - - - . Contents K .
. Contents L - N . - - - .Contents O - R .
. Contents S . - - - . 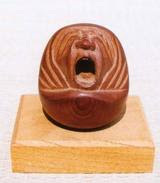 Contents T - Z .
. Latest Updates - Daruma Museum NEWS .
. . . SEARCH . . .
. . . NEWSLETTER . . .
. ASK ME . . . any question about Japan !